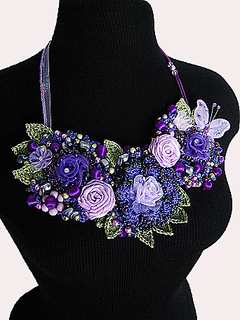 This Beaded Jewelry Pattern will teach you how to make these very popular and trendy necklaces. 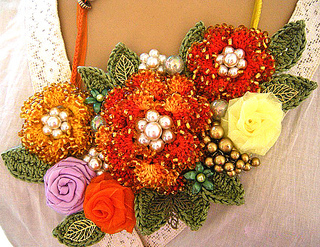 No need to know how to crochet anyone can make these using satin, organza, crochet flowers, even vintage costume jewelry so it is not limited to just crochet flowers although that’s what I used. This Bib Necklace Pattern will show you how to make these popular & trendy necklaces. Note: This tutorial and pattern does not use any kind of GLUE. However if you choose to use glue then you can still make this beautiful necklace but you wont be able to use specific components. This pattern is 35 pages long and includes 50 photos. You will get a detailed list of everything needed and the sources I purchase from. This is a Step-by-Step tutorial with detailed photos and explanations. If you choose to make these and sell them at craft shows/fairs this is the tutorial you want to purchase. No one wants to purchase a product that is not well made and put together. I leave nothing to guessing, it is very detailed and thorough. Your creations will come out Absolutely Stunning! You will be able to name your price and it will be well worth every penny! Look at the photos, they speak for themselves! I’ve labored long hours to bring you this exceptional tutorial, I know you will enjoy it! I take pride in the patterns I design and write if you’ve purchased any of my crochet patterns then you know how clear they are. Crochet Flower pattern is not included. Pattern for beaded Flowers are available separately. Tutorial will be sent to your email address on file with paypal within 24 hours after payment has cleared and usually sooner.